Your child sleeps safely so you sleep soundly. Oliver’s Bed is designed for disabled children/young adults and/or additional needs by the proud manufacturers and parents 123 Sleep Ltd.
Paediatric hand crafted safe sleep system, fully enclosed to support child throughout the night. A great alternative to a standard hospital bed and designed for children with cerebral palsy, down syndrome, Angelman Syndrome, developmental disabilities, cognitive disability, visual impairment, epilepsy, neuro-disabled and others but to name a few. The child is surrounded by hardwood frame coupled with soft sided fabric panels that eliminate the possibility of the child falling or wandering. A fully enclosed safe bed, fully padded for the safety of your child / young adult. Each bed hand crafted from start to finish & fully installed. Oliver was born in 2007 and was a very happy content baby, but after several months, he failed to reach his milestones. We were concerned about his progress and failed to convince the Health Visitor that he wasn’t gaining his early year skills. As a cabinet maker, Olivers father studied the bed and with several email conversations with the makers of the Courtney bed, we came up with Oliver’s bed, a unique bed for a little boy, a bed with dignity. We had been searching for a bed for our little girl for so long and didn’t ever think that we would find one that offered her safety but also dignity. When it was installed and she was put in it for the first time, I cried. A big thank you to Jon and Tracey for supplying our daughter with a safe sleeping environment, we love it. 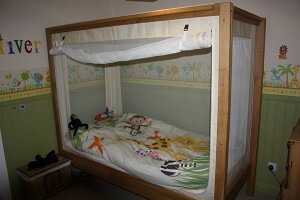 Our son had been banging on the sides of his cot bed for as long as I could remember, we wanted a large travel cot. When we heard about Oliver’s bed from another angel family, we thought all our prayers had been answered. It was installed within a couple of hours, our son slept soundly that night, thanks again Oliver’s bed. I would like to say a massive thank you for my sons bed, it has made such a difference already. He managed to sleep for 6 hours by himself without been distressed or hurting himself for the first time in months.